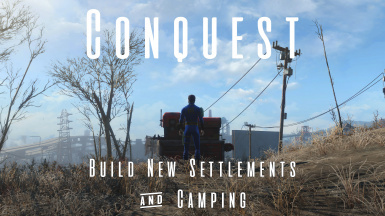 Conquest allows you to build a campsite or full settlement almost anywhere in the Commonwealth. Mogman64's Conquest Vault 111 Hilltop Fort Not possible without this Mod. Transfer Settlement - Train Home Blueprint REQUIRED - Obviously; this is the one mod you need to use this. - Should now correctly acquire the Action: Build Campsite and the ReadMe directly after exiting Vault 111 when starting a new game. Build a new settlement almost anywhere! Conquest is a camping and settlement building mod from the author of Frostfall for Skyrim. Featuring a variety of camping equipment and the ability to build entirely new settlements, it makes for a great companion for normal and Survival Mode players alike. Build a small campsite, cook, sleep, and recharge while on the road. Then pack up and head out, or make your mark by expanding your campsite into a thriving, fully-functional settlement. By investing in a new Workbench, your campsite will become a full-fledged settlement, with all of the benefits and troubles that come with it. For now, you can build up to 10 new settlements. A full in-game Read Me is included on the "ReadMe: Conquest" holotape. 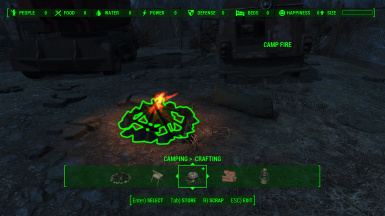 To camp, open your Pip-Boy's inventory screen, navigate to Aid, and select "Action: Build Campsite". Exit the Pip-Boy and place the Camping Supplies on the ground. After you place the Camping Supplies, you can place other camping equipment using a special Workshop menu. At a campsite, you can build a campfire, place a cooking pot, scrap weapons and armor, build a tent, place a portable generator and lights, sleep in a sleeping bag, and more. TIP: You can only camp when far enough from cities and other settlements. After you've successfully created a campsite, in the Camping Workshop menu, navigate to Expansion > Workshop. Place the workshop wherever you like. Once you do, your campsite will be returned to your inventory and your settlement will be created. You can name your settlement one of 10 different names, and you can create up to 10 different settlements. If you don't like the settlement you've created, you can dissolve it to free up one of the 10 available settlements. To do this, select the Workshop, and select Dissolve Settlement. Read the warning, and confirm your choice. The settlement will be dissolved. Since Conquest allows you to build a settlement almost anywhere, exercise good judgement when deciding where to place your new settlement. Remember the following guidelines when placing your settlement. Make sure you build an adequate number of beds before trying to send existing settlers to your new settlement, or they may simply decide to leave. If you build a radio tower without building beds, no new settlers may be recruited. If moving a settler from a very distant settlement to your new one, there is a chance they may not survive the journey. Try to transfer settlers from nearby settlements. Make sure that settlers can path into / out of your settlement area easily, or you may never see them appear. Bridges seem to be problematic for settlers to understand how to navigate, so new settlements should not be built on them. There is currently no build limit imposed for custom settlements through Conquest. Build responsibly, and save often in several save slots. If you build a settlement in an area that can respawn with enemies, those enemies will still respawn at the location of your settlement from time to time. Remember to create and use the Bell if you can't find some of your settlers. Building new settlements in interiors should work, but acquiring the resources necessary to sustain a settlement in a building might prove to be problematic. You will also not be given a map marker on the world map. You can create supply lines to and from your Conquest settlements as normal, but you will see the message "Loading supply lines..." when the workshop is opened. This may take several seconds as a summary of connected workshop items is created. Please be patient; the workshop will open (or re-open) in several seconds. This is due to the way the base game works, and Conquest settlements must handle connected supply lines in a special way. You cannot send a settler or follower to the settlement you are currently standing in. To send them to a custom settlement, move outside of it first. Currently, General Goods, Armorer, and Weapons vendors created at a Conquest settlement may not buy or sell anything. Clinics will function correctly, however. If you save your game and then load it while your character is in a Conquest settlement, your Pip-Boy menu may list the settlement name as "Commonwealth" or similar instead of the actual name. This is an aesthetic problem only and is fixed if you leave the settlement and then save and load again. Should be compatible with all new "scrapping" mods. Should be compatible with all mods that add buildable workshop items to existing workshop categories. 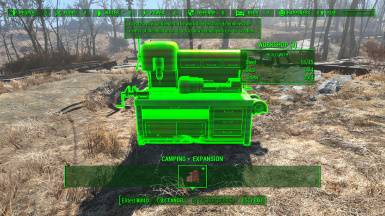 Should be compatible with all mods that overhaul settlements or workshop behavior. "I built a settlement, but I couldn't scrap most of the objects inside it. Can you fix this?" Due to changes made to the Creation Engine for Fallout 4, not all objects in the world are "addressable" any longer like they were in Skyrim, or all previous Bethesda games; many objects in the world are grouped together and share a single address (undoubtedly to improve performance). The side effect is that I cannot offer arbitrary scrapping of all items in the wasteland. Many of the single items you can scrap within a settlement were specifically placed that way (ungrouped) by the game developers. I get this question a lot, so to be clear, this mod will NOT allow you to scrap all (or even most) objects in the Wasteland; many will be unscrappable. This is a game engine limitation of Fallout 4 and is something that is completely, entirely, 100% outside of my control, and is not a bug! "Does this mod change how settlements work?" 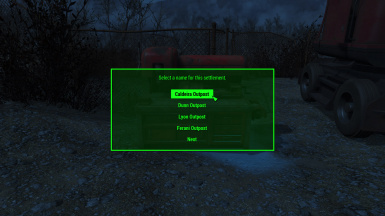 No, this mod does not change how normal settlements function. "My settlers are acting strange / I encountered a bug." The settlement system as found in the Fallout 4 base game has a number of outstanding bugs, and this mod does not fix any of them. Please ensure that the bug you are experiencing isn't a problem with the settlement system itself as reported by other players. Otherwise, please report the bug to me on the mod page comments. Please be as descriptive as possible, and include your platform (PC/XB1/PS4). "I created a settlement, but no settlers seem to want to show up." See the SETTLEMENTS section, above, for tips on building an effective settlement. They will come if you are patient, have beds, and they have a way to actually get to the settlement on foot. The names of the settlements are based on the last names of several Quality Assurance engineers that worked on Fallout 4 for Bethesda. For all your hard work filing bug reports, convincing developers that yes, there actually is a bug, and long nights spent doing the same repeated boring actions and logging the results, I have a ton of respect for QA. These settlements are for you! This mod is in part inspired by the indie game Kingdom by Noio, Licorice, and Raw Fury.